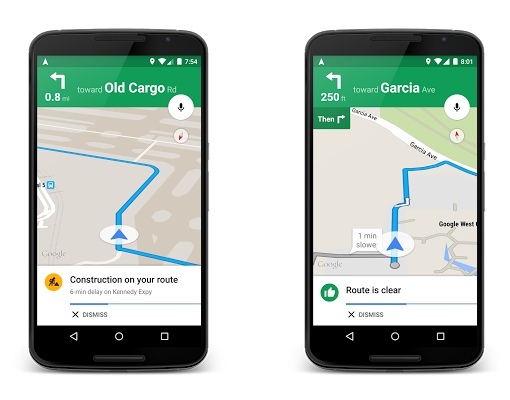 Today, Google announced a terrific new feature for its popular Google Maps mobile app: traffic alerts. When you enter your destination into the app, it will now speak back to you any potential problems along your route, like a construction zone that may delay your trip. The app will then offer you a choice of alternate routes, explaining why they were chosen. The app will also keep close watch on road conditions while you drive. Any time congestion appears during your drive, the app will now tell you what’s causing the problem, how long you can expect to be stuck in it and if there’s a reasonably efficient route around it. Traffic alerts are both spoken and appear on screen in text. I love data, so you know I’m incredibly excited about the new feature. Unexpected traffic gives me a lot of anxiety, but I’ve learned it’s easier to handle if I know the details behind the delay and just how temporary it will be. I also appreciate the insight into why Google picks the routes it does – I’ve never been fan of taking a detour through an unfamiliar area without knowing exactly why I’m doing it. Google Maps currently offers GPS-based navigation, real-time traffic and mass transit data, user-submitted incident reports (via Waze), street view mode and information on over 100 million destinations like stores, restaurants and public buildings. The new traffic alerts feature is rolling out now, so be patient if your device doesn’t have access to it yet. You can download Google Maps for Android devices via Google Play and for Apple devices via the App Store.